As Boston personal injury lawyers, one of the first questions we receive from our new clients is “Will I have to go to court?” Our injured clients have already experienced the pain and frustration of being injured in an accident. This stage is when a personal injury claim has not yet been filed in court. During this stage, your personal injury lawyers are working with a claims adjuster in hopes of settling the case. If the parties can agree on a number at this stage, then the case settles without the need for a lawsuit to be filed. However, if a settlement cannot be reached, then the next step is a lawsuit. During this stage is when the case has entered the court system. Depending on the size of the case, the case will be filed in either District Court or Superior Court. This stage involves your lawyer and the lawyer(s) for the insurance company exchanging information, doing depositions, filing motions, and going to court appearances. Keep in mind the case can settle at any point during litigation. Rather than serving as an obstacle to settlement, lawsuits generally can spur a settlement. At this point the case has still not settled so the parties need a jury to decide the case. At this stage you will go to court with your attorney and your attorney will present your case to the jury. The insurance company lawyer(s) will present their case to the jury. 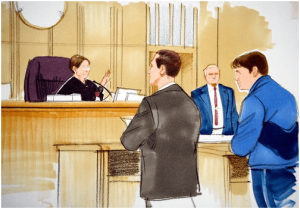 Keep in mind a case can settle on the courthouse steps even during trial. If settlement does not happen the jury will render a verdict. We have extensive experience investigating, negotiating, litigating and trying personal injury cases. Call us today to get started. Keep in mind that the court process for Massachusetts workers compensation cases is much different, and is handled by an entirely different judicial process.